please forward to 20 friends . . .
Sound familiar? Chain letters always promise phenomenal return for small effort. The simplest lists a random number of people and you’re instructed to send something to the top person on the list. In this case, it’s a recipe. Then you remove the top name, bring the second person into the top position, then add yourself at the bottom, then send the same email to 20 of your friends. Theoretically you’ll receive 36 recipes in return, and since there are only two names on the list now–the person who sent it and yourself you’ve just added–the turnaround should be quick. There are other chain letters, too, those that promise good luck (or money or other enticement) to anyone who sends the message to others–usually within five minutes–and bad luck to those who don’t. Those I ignore. The recipe exchange I’ve tried before, however, and I can’t recall a single recipe I’ve gotten back. Years ago–before self-stick stamps and envelopes and word processing software–these same requests came in the form of hand-written letters, faithfully copied X-times and stuffed into X number of hand-addressed and licked envelopes and stamps. I honored those a few time too, and only remember a trickle of returns–one or two at most–after I’d spent money, time and effort on stationery, envelopes, and stamps. The only plus I can see is that I was contributing to the coffers of the U.S. Postal Service. Something interesting, or pathetic–depending on how you choose to look at it–has happened over the past couple of decades. The sad truth is, I really don’t have 20 email friends who would want to participate in this kind of thing. When they want a recipe, they go–as I do–to google.com, food blogs, or personal recipe book collections. I suspect also, this may be the consequence of moving around the country–all for legitimate reasons of course–over the past 40 or so years, at least in my case. Even though I’ve gotten better at saying no as I’ve grown older, it’s still not easy. It still feels bad when I decline these innocent chain letter requests. I’m getting practice though–twice in just the past several weeks. So I’m compromising here, trying to make myself feel better by sharing the most recent recipe I’ve tried with not just 20 friends but the whole web-wide world, as the letter stated, something quick, easy, and without rare ingredients, one I know if my head and can type right now from my head. Hubby and I both enjoy a bite or two of something sweet after dinner, but we both know too much sugar is not good for either of us. So I made chocolate-covered banana bites. They were being sold in Costco a few weeks ago and I reckoned I could make them at home easily and cheaply, without all the preservatives. Most women I know could have figured it out on their own, but the idea may not have occurred to them yet. Here’s how. (1) Take three ripe bananas–those showing little brown spots on their yellow peel–and cut into bite-size pieces between 3/4″-1″. Lay them in a single layer on a wax-paper-covered cookie sheet (foil would work too). (2) Pop them into the freezer for an hour or two. 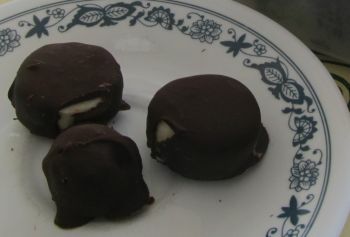 (3) Melt a 12-ounce package of semi-sweet chocolate chips over a double boiler. TIP: Place over HOT–not boiling–water and stir occasionally until melted. (4) If the chocolate feels too thick for dipping, stir in enough vegetable oil (for me 3/4 tablespoon worked well) to thin. (5) Since the banana bites are frozen, it may be difficult to poke a toothpick or fork tip in, so you’ll need to figure out the best way to drop them into the chocolate, twirl about to cover, and retrieve without getting hot chocolate all over yourself. A teaspoon worked for me. (6) Dip them out and arrange, again in a single layer, without touching each other on that cookie sheet. They’ll dry with a sheen after a moment or two. (7) Put them into a suitable container and store in the freezer. Next time you crave a little something chocolate or a little something for your sweet tooth without over-indulging, reach in and grab one or two, and pop them into your mouth. Or you can wait a few moments ’til the insides thaw a little if you like. The chocolate stays firm. As you indulge, you can rationalize how good bananas are for you–all that potassium and stuff–and satisfy your chocolate craving all at the same time, and with minimum guilt. UPDATE: After making this the second time, I discovered it’s best NOT to freeze the banana bites first. If you don’t work real fast, the frozen banana causes condensation that causes the chocolate not only to get too thick, but it loses its sticking power. So, next batch, NO PRE-FREEZING, and that eliminates the problem of what tool to implement in dipping and dropping. A fork works just fine. This entry was posted in musing, Musings, unapologetic foodie and tagged Banana, Chain letter, Chocolate, Chocolate chip, Costco, Recipe, Sheet pan, Types of chocolate by Alice. Bookmark the permalink. LOL I don’t do chain letters either. Now that I’ve learned to say no I feel so liberated. Who knew? Glad you like the recipe. I ignore all chain emails. I did get this one from a friend, I binned it and wrote privately to tell them I did so, and why. Thanks for the recipe. I do something like that with crystallised ginger. Yummy! Hubby’s quite fond of ginger, I’ll have to remember that. I like tossing in a few nuts–like almonds–into the leftover chocolate and making my own simple candies, too. Anything with chocolate on it will do. Just peeling the banana and freezing it in a plastic bag is also good. Covering it with chocolate is obviously much better. Love the poem about the bull. He’s such a good poet. I always enjoy his work. as long as you’re not allergic to chocolate! Can you think of many things worse? I, like you, don’t even bother to say no any more. I just get me awaaay from those letters without a world. That’s a delightful sounding goodie that might also be good for you too. 😛 That’s what I tell myself, anyhow! It’s also a good way to use up those yukky brown-spotted bananas. It is a good thing I don’t live too close to you and that I am one of the rare souls who really doesn’t like bananas in any form, or else, I would be fatter than I am already. I am also one of those people who delete chain letters faster than the speed of light. Good post, Alice. Strawberry season is here! Those should be yummy covered in chocolate, and you don’t need to freeze. I think dried fruit–raisins, cranberries, whatever–would work perfectly. If you try those, let me know.